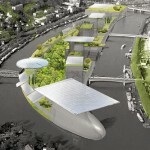 New plans to develop the island of Seguin in the Seine river in west Paris will begin next year, according to French newswire AFP and other article from Art Media Agency. Located between the communes of Boulogne and Billancourt, the island was bought from Renault several years ago by an anonymous company, of which the cities of Boulogne and the Hauts-de-Seine department make up over 70% of shareholders. Architect Jean Nouvel was nominated in 2009 to coordinate the project and has proposed building five tall towers, a long garden under glass, shops, cinemas and music and art centres, taking up the entire 11.5 hectares of land. According to the model, there should be plenty of greenery, however the height of the tower buildings has been reduced by 20%, following discussions with residents from the community of Meudon, just opposite the island. From 1929 to 1992, the island was home to a construction factory, which took up almost the entire island, for car manufacturer Renault. 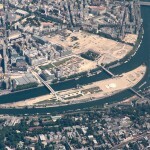 The buildings were finally torn down in 2005, leaving plenty of space ready to be developed.